In addition to a collection of the world's most extraordinary geysers and hot springs, Yellowstone is home to a large variety of wildlife including grizzly bears, bison, elk and wolves. The wolf is a major predator that had been missing from the Greater Yellowstone Ecosystem for decades until its restoration in 1995. The gray wolf (Canis lupus) was present in Yellowstone when the park was established in 1872. Predator control, including poisoning, was practiced here in the late 1800s and early 1900s. Between 1914 and 1926, at least 136 wolves were killed in the park; by the 1940s, wolf packs were rarely reported. An intensive survey in 1978 found no evidence of a wolf population in Yellowstone, although an occasional wolf probably wandered into the area. During the 1980s, wolves began to reestablish breeding packs in northwestern Montana; 50-60 wolves inhabited Montana in 1994. In late 1994/early 1995, and again in 1996, USFWS and Canadian wildlife biologists captured wolves in Canada and relocated and released them in both Yellowstone and central Idaho. In mid-January 1995, 14 wolves were temporarily penned in Yellowstone; the first 8 wolves on January 12 and the second 6 on January 19, 1995. Wolves from one social group were together in each release pen. On January 23, 1996, 11 more wolves were brought to Yellowstone for the second year of wolf restoration. Four days later they were joined by another 6 wolves. Since their release, wolves have been doing well. 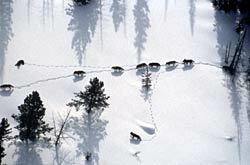 At the end of 2006, at least 136 wolves in 13 packs occupied Yellowstone National Park. Preliminary data from studies indicate that wolf recovery will likely lead to greater biodiversity throughout the Greater Yellowstone Ecosystem (GYE). Wolves have preyed primarily on elk and these carcasses have provided food to a wide variety of other animals, especially scavenging species. They are increasingly preying on bison, especially in late winter. Grizzly bears have usurped wolf kills almost at will, contrary to predictions and observations from other areas where the two species occur. Wolf kills, then, provide an important resource for bears in low food years. Aggression toward coyotes has decreased the number of coyotes inside wolf territories, which may benefit other smaller predators, rodents, and birds of prey. So far, data suggests wolves are contributing to decreased numbers of elk calves surviving to adulthood and decreased survival of adult elk. Wolves may also be affecting where and how elk use the habitat. Some of these effects were predictable, but were based on research in relatively simple systems of one to two predator and prey species. Such is not the case in Yellowstone, where four other large predators (black and grizzly bears, coyotes, cougars) prey on elk—and people hunt the elk outside the park. Thus, interactions of wolves with elk and other ungulates has created a new degree of complexity that makes it difficult to project long-term population trends. The effect of wolf recovery on the dynamics of northern Yellowstone elk cannot be generalized to other elk populations in the GYE. The effects depend on a complex of factors including elk densities, abundance of other predators, presence of alternative ungulate prey, winter severity, and—outside the park—land ownership, human harvest, livestock depredations, and human-caused wolf deaths. The biological requirement for removing the wolf from the endangered species list has been achieved: Three years of 30 breeding pairs across the three recovery areas. The U.S. 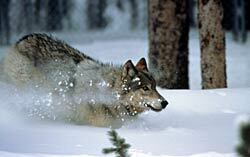 Fish and Wildlife Service (USFWS) has approved the wolf management plans of Idaho and Montana. As a result, day-to-day wolf management has been transferred to these states. USFWS has proposed delisting the wolves in Idaho and Montana, and in Yellowstone and Grand Teton national parks. Delisting is not proposed for the state of Wyoming because of disagreements over state wolf management if delisting were to occur. Therefore, wolves in Wyoming (outside the national parks) are still managed by USFWS.